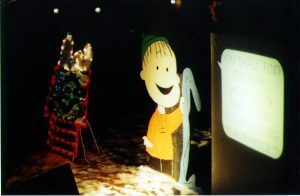 The Linus Shares the Gospel display was added to the display for Christmas 2000. For Christmas 2002, Linus became part of our Peanuts Nativity Pageant display. This article will take you through the progression of how this display item was conceived, how we used an old Kodak slide projector to add “speech bubbles” for many years, how it came to be epanded into an entire Nativity, and then how it was converted to use video projection instead of the mechanical slide projector. 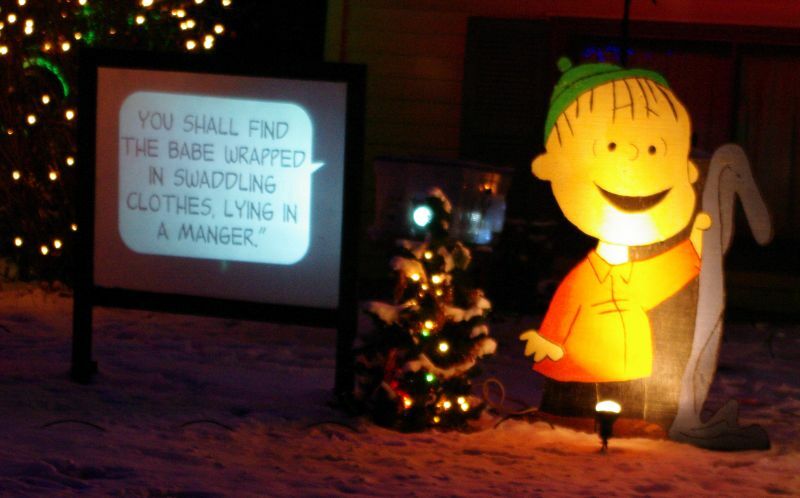 Linus’ display is unique in that it shares the gospel message via projected speech bubbles. If you’ve read the Why We Do It page, you know that we try to use our Christmas display as a subtle ministry tool to help spread the good news of the birth of Jesus Christ, as well as provide a statement of our faith. With this display (and now the full Nativity Pageant), we are able to do this much more directly. We had considered putting this off until 2001, since it was getting close to “lights on”, but after Cathy was sharing our plans with some friends from church choir, one of them liked the idea so much that they gave us the Snoopy display as a gift to get us started. So, this became my motivation to get it done for Christmas 2000. 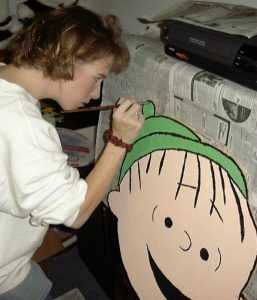 Linus is based on an actual video capture from the the segment in the TV special where he tells Charlie Brown “what Christmas is all about.” Cathy, being the artistic one, painted him on a piece of plywood with acrylic paints, and we used clear polyurethane for protection and weatherproofing. Next came the question of how to do the gospel message. I was worried that we wouldn’t be able to do it justice in just a few sentences on a painted sign. Then, the idea came to me to do a changing message using projected slides. The pieces quickly came together: My mom had a slide projector that’s been in storage for a long time. I picked up a slide timer and some other parts on eBay. We divided up the message up into a 20-slide presentation, which we created in PowerPoint and converted to slides. It was duplicated it 4 times to fill up the 80-slide carousel. The slide projector is protected from the elements by a standard plastic storage container, in which I cut out one side and replaced it with a piece of clear Plexiglas so the image can be projected through it. During the off-season it is used for Christmas storage. Linus in progress. Here, Cathy puts the finishing touches on him, first before he is cut out, and then after. One major challenge in getting the projector to work was temperature: the projector gets very warm when operating, but will get very cold when the lights are turned off. Since our lights operate on timers, it needs to come on automatically at the appropriate time. However, in my early tests on a very cold morning after leaving the projector outside, the internal motor would not even spin up. The solution? A standard heating pad from Walgreen’s. The projector sits on the heating pad, and that seems to keep it warm enough to be OK. However, I couldn’t just leave the heating pad on all the time– the projector lamp already got very hot on its own. So, I wired up a relay box, which makes the heating pad go on when the light timer is not on, but once the projector switches on, the pad automatically shuts down. I felt this, combined with some strategically placed ventilation holes in the storage container, combined with our Minnesota cold would keep it cool enough when it is running. Well, it wasn’t enough. Initial tests showed the box heating up, but not severely. So we set it up for real and thought the display was finally on-line. To my dismay, after a few hours, I looked outside and the projector had shut down. Inspecting the damage, I found things had really overheated. The projector wouldn’t power up at all, and the slides had warped badly. I thought this spelled the end of the “shares the Gospel” part of our display for that year. It really ruined my night. 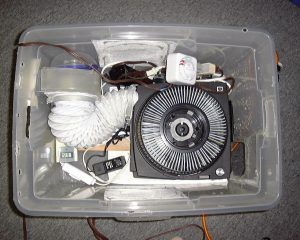 This is a view inside of the 2001 projector box. The brown cord brought in power to a timer (white box). The projector sat on a heating pad (white cord), which was connected through a relay box (black box near top of picture) which connected both before and after the timer and turned off the pad when the display is on. The large white duct and fan drew hot air directly out of the projector and outside of the box. In the bottom left corner is the timer which advanced the slides, the heating-pad control, and a remote digital thermometer to monitor the temperature inside the box. As of 2010 we use this same enclosure, but with a video projector instead of the vintage slide projector. Video is fed into the box from the computer that runs all of our lights. (click the picture for a larger view). Upon further inspection, it turned out the damage wasn’t as bad as I thought. The projector wasn’t ‘fried’, but a thermal fuse designed for factory service had blown. I immediately ordered a replacement part, and determined that we just might have it working for Christmas 2000 yet. Cathy and I sorted out the ‘totally ruined’ slides from the ‘warped but usable’ slides, and we recreated replacements for the ‘ruined’ bunch. And I “went crazy” with ventilation for the box. With some creative uses of Tupperware-type containers, I added large (and hopefully weatherproof) vents to both sides of the box, as well as the top. I also included a PC cooling fan which comes on with the projector. The temperature in December 2000 remained below zero degrees Fahrenheit the entire season, but the box heated up to 55 degrees or higher. This temperature differential made me very nervous, so I beefed up the cooling capacity of the box for 2001. I used a blower that came out of our old dishwasher, connected a 4″ flexible duct, and positioned it directly against the output of the projector (see the picture above). The effect is to draw the warm air directly from the projector and expel it outside the box, rather than simply venting the box. This setup worked very well for years, as we used it from 2001-2008 without any major changes. 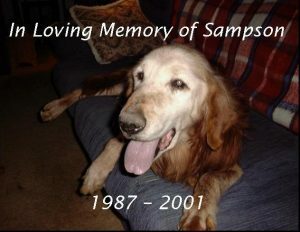 For the 2001 display, we substituted a slide in memory of our golden retriever Sampson, who passed away in October of that year. 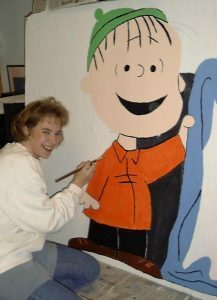 For the 2002 season we added the Peanuts Nativity Pageant and Linus is now the Narrator for this pageant. Since the pageant contains a new Snoopy figure, the original “Snoopy on Doghouse” has been separated from Linus, and is used in the “Toyland” section of our display. For the 2004 season we replaced the projection screen. Previous displays used a simple plywood screen covered in plastic. This required front projection, with the projector box visible in the middle of the yard. For 2004, we built a rear-projection screen by sanding a piece of Plexiglas to make it cloudy, and building a wooden frame for it. We also purchased a wide-angle lens for the projector, which could now be placed directly behind the screen. The result was a better visual presentation of the Gospel message. For the 2009 season we finally abandoned the old slide projector and switched to video projection. To keep the spirit of the Linus display (and the Gospel message) alive, we maintain the “speech balloon slides” for about half of the songs. The other half of the songs contains video synchronized to the music and lights. It was a nice update to one of our older homemade displays. For the 2010 season we upgraded to a better video projector, which greatly improved the brightness over the 2009 projector, and even over the old slide projector. Having video gives the display a whole new element. So thanks to the Peanuts gang and Charles Shultz, viewers of our display are able to see the real meaning of Christmas.